The third and final part (Part I / Part II) of manicstreetpreacher’s reassessment of Christopher Hitchens’ debate against William Lane Craig will examine the “emotional blackmail factor” that pervades Dr Craig’s case for the Almighty. When Craig is not appealing to flawed logic, he appeals to common sense and inner feelings to guilt trip his audiences into accepting his arguments as this last post will demonstrate. Both of Craig’s premises are flawed, so his conclusion is invalid. Firstly, objective morals could well exist without God. They could be hardwired into our genes as an evolutionary survival mechanism. So clearly, Craig’s first premise is incorrect. However, objective moral values de facto do not exist. Not everyone has the same moral standards. Our perception of what is right and wrong have changed over the centuries with Richard Dawkins has termed “the shifting moral Zeitgeist”. Indeed, practices in other parts of the World today which are considered the height of piety seem barbaric to Westerners. You only have to look inside the books of our religions and see what these pronouncements mandate to see that this is the case. I am becoming increasingly convinced that the moral argument for God is just rank wishful thinking, (how this differs from all other arguments from God, I am not entirely certain). Perhaps it would be wonderful if there was a list of rules set in stone somewhere in the metaphysical universe, but I simply don’t see any evidence for it. We just have to feel our around, sometimes getting it right, sometimes making mistakes, always striving for a state of moral perfection regardless of whether that will ever be achieved in reality. I really wish that Hitchens had raised Craig’s appalling views on the morality of the God of the Old Testament. I had been very suspicious of Craig declaring the atrocities of the Israelites’ slaughter of the Canaanites to be off-limits in debates, since it was a question of biblical inerrancy, not whether God existed. I found my answer in an appalling radio interview and then with an article on Craig’s website which I commented on a few months after the Biola debate in which Craig argued that since God sets down moral values, he can arbitrarily overrule them with the result being that murder, torture and ethical cleansing are suddenly all fine and dandy. Therefore, the Israelites were acting entirely in accordance with the will of God in exterminating the Canaanites and the Bible’s inerrancy is unaffected. I won’t repeat my piece here; I suggest that it is read in full, but it is a stunning indictment of the theological mind which totally undermines Craig’s argument from objective morality, since he knows that murder, torture and genocide are wrong independent of God’s commands. It is also a graphic illustration of Plato’s “Euthyphro Dilemma”: if God tells you to torture a baby, it becomes morally right and indeed obligatory to torture a baby. A key component in Craig’s argument for the resurrection of Jesus is that his followers would not have believed in a dying and rising Jewish messiah, much less have died for that belief. For his second rebuttal after cross-examination, a clearly weary Hitchens invoked Tertullian’s maxim credo quia absurdum: “I believe it because it is absurd”. He recounted his research on Mother Teresa and the circumstances surrounding her thoroughly discredited post-death miracle that will see her canonised by the Vatican and will in fact contribute to the misery and suffering of millions in the Third World by promoting shamanism and devaluing modern medicine. A fair point, but I have seen Hitchens do much better on the historical Jesus. Check out these two clips from his debate against D’Souza at Freedom Fest 2008 in Las Vegas. Craig is basing his argument on discredited sources that are self-contradictory, written decades after the events that they purport to describe, copied and re-copied over centuries by fallible scribes with their own theological axes to grind. And as we shall see in the next section, this is not even the reason why he believes in the resurrection at all. In his opening speech, Hitchens quoted from two editions of Craig’s book, Reasonable Faith, where Craig argues that a person knows that Christianity is true because the “Inner Witness of the Holy Spirit” assures him that it is true. Whereas reason and evidence can be used to support this proposition they cannot be used to overthrow it. A person has enough assurances from God with regard to his existence and the consequences that will be metered out for rejecting belief in God are entirely on the shoulders of the non-believer. Dr Craig then freely admits that his conviction arises from purely subjective factors. To me it sounds no different in principle from the teenage Mormon door-knocker: he tells you that the Book of Mormon was written by ancient Americans because he has a warm swelling feeling inside when he asks God if it’s true. Craig said that Hitchens had to show that he is delusional; otherwise his belief in God through personal experience is still valid. Again, this is a prime example of Craig placing the burden of proof on his opponent. Without access to Craig’s medical records (I’ll avoid making the cheap shot that they would make for interesting reading! ), this is an impossible task. Nevertheless, people have all sorts of personal experiences that seem real to them: out of body, alien abduction, near death. Without any corroborating evidence, the sceptic is perfectly justified in writing them off as deluded, not matter how sincere they are. Indeed, virtually all of these experiences can be reproduced on subjects in the lab under control conditions. So what sort of evidence would corroborate personal religious experience? As Victor Stenger points out in God, The Failed Hypothesis and The New Atheism, perhaps if someone returned from such an experience with some new knowledge in their heads that they could not have otherwise obtained except through the agency of an all-powerful, all-knowing supernatural being. If Craig really does have a hotline to the Big Guy in the Sky, then I don’t know why he hasn’t found a better way to spend his evenings than arguing with miserable heretics like Hitchens who are all fire-bound anyway. Perhaps personal experience of God is something I will address in a future post, but for now I’ll direct Craig to Sam Harris’ take on the argument from meaning and purpose with his “Diamond The Size of a Refrigerator Buried in Your Back Yard” Gambit for him to realise what a risible non sequitur his reasoning is. The debate moderator, Hugh Hewitt, posed the final question of the evening to Hitchens and asked why there was such a high public demand for debates on the God question at present. Hitchens’ reply was that he is part of a small group of people who want to take a stand against theocratic bullying from Islamist regimes in the Middle East who are soon to obtain nuclear weaponry, terror attacks against civilian non-combatants by Al-Qaeda, fanatical Jewish settlers stealing land from Palestinians to bring on the Messiah and fundamentalist American Christians who want junk taught in school science classes. For the first time that evening, Craig had to wait politely as the audience’s applause died down before he could retort. I could accept every one of Craig’s five arguments; you still have all your work ahead of you convincing me that the Pope, the holder of the keys of St Peter, Christ’s vicar on Earth is objectively moral to go to Africa and say, “AIDS might be bad, but condoms might be worse”. This is a sinister and immoral aspect to religion that interests me more than the mere existence of God and the truthfulness of the scriptures; one which Hitchens tackles head on, but Craig wilfully evades. Craig may have won the battle. But the outcome of the war might not be so rosy for him. manicstreetpreacher’s second out of three posts (Part I / Part III) reassessing Christopher Hitchens’ debate against William Lane Craig discusses the “Rubik’s Cube factor” of Craig’s continually evolving God in the face of objections to design. As always, Craig started off the debate by presenting his bog-standard five “arguments” that make it seem rational that God exists: origins of the universe, fine-tuning of the universe, existence of objective moral values, resurrection of Jesus Christ and personal experience of God. In CraigWorld these are so amazingly irrefutable that he has used them in just about every debate for the past 15 years, despite their obvious weaknesses and being corrected ad infinitum by opponents and critics. However, Craig will still say he has won the debate unless and until his arguments have been “torn down” and “a new set of arguments” put in their place. Has it ever occurred to Craig that his “arguments” are not worth expending the effort? After all, you can make a plausible case that the Earth is flat or that the Holocaust never happened if you limit the debate to a narrow set of facts and arguments. Consider the case of Thomas Aikenhead, a teenage medical student who was the last person in Britain to be executed for blasphemy in Edinburgh, 1697 for scorning the Holy Trinity as “a rhapsody of feigned and ill-invented nonsense” and “not worthy of man’s refutation”. Can’t Craig learn anything from this? Why resort to “arguments” at all? Atheists hardly ever raise the argument from hiddenness in a debate, but let’s face it: there is no empirical data whatsoever in support of the existence of God. The fact that debates have to be held on this question at all has to say a great deal. If God does exist, why does he choose to remain hidden? Wouldn’t it just be great if we could see God creating new planets and species in front of eyes rather than just having to makes “inferences to the best explanation”? Anselm’s Ontological Argument declares by fiat that existence is both a necessary and great-making property and therefore a maximally great being by its very definition must exist in reality. Fine. I could engage in the same smart-Alec sophistry by declaring that evidence, proof and certainty beyond reasonable doubt in the minds of all living creatures in the universe are great making properties and therefore by definition such a being does not exist. Before turning to Craig’s “arguments”, I have previously posted a series of highly amusing and irreverent YouTube videos refuting Craig’s arguments. Victor Stenger, American atheist physicist, presented plausible rational alternatives to Craig’s supernatural “God of the Gaps” reasoning during their 2003 debate the University of Hawaii. Craig is being flagrantly dishonest by continuing to assert that the universe began to exist with the Big Bang singularity. Although not on this occasion, Craig has quoted Stephen Hawking as writing, “Almost everyone now believes that the universe and time itself had a beginning at Big Bang.” However, Hawking and his partner in physics, Roger Penrose, have recanted an earlier thesis when they said that the universe began with the Big Bang singularity. But hacks like Craig and conservative Christian apologist Dinesh D’Souza mine extracts from Hawking’s A Brief History of Time and The Nature of Space and Time to make it appear that Hawking still believes that the universe began with the Big Bang singularity. D’Souza has glanced at A Brief History of Time, mining quotations that seem to confirm his preconceived ideas. He quotes Hawking as saying, “There must have been a Big Bang singularity.” D’Souza has lifted it out of context and given it precisely the opposite meaning of what Hawking intended… Hawking was referring to the calculation he published with Penrose in 1970, and D’Souza cut off the quotation. This act of editorship makes it look like Hawking is confirming that the Big Bang actually happened when in fact the full quote reveals just the opposite. Craig’s assertion “out of nothing, nothing comes” is sheer folk wisdom. We see apparently uncaused events all the time in radioactive decay. Firstly, Craig ought to have looked at the smoke detectors in the Biola gym and considered when a particular Americium atom decays inside it, what caused one to decay rather than some other one. The answer is nothing that we know. Secondly, even in a vacuum, virtual particles come into existence all the time and are measurable. Appealing to “common sense” reasoning when it is at odds with modern physics contradicts is not intellectually honest. Craig responds to Hitchens’ speech by saying that he has no positive arguments to show that “atheism is true”. This is a misrepresentation of the atheist position and part of Craig’s debating trick to shift the burden of proof onto his opponent when he is the one advancing the positive claim. Atheism is a term devised by the religious to label people who do not share their views. It is the opinion that theism is untrue since there are no good reasons to believe that God exists. There is no evidence for God and saying “God did it” in order to explain away the existence of the natural world is no explanation at all. Craig is asking the impossible by demanding arguments or evidence that God does not exist. Having loaded the burden of proof onto his opponent’s shoulders, Craig excused himself from having to provide anything like the extraordinary evidence that his extraordinary claims warrant. He said that he was arguing for the “best explanation of the data”. But even if the debate were only about inference to the best explanation, Craig has still not provided anything like the level of proof required to discharge his claims. Craig closed his first rebuttal by saying that all the evidence has been on his side. He certainly presented reasons to believe, but that does not mean that they were any better than those for Russell’s teapot or the Flying Spaghetti Monster. Subsequently, Craig showed that providing evidence against God is pointless, since far from “Christians being able to follow the evidence wherever it leads”, believers can move the characteristics of their God around like a Rubik’s Cube so that God confirms with the empirical data post hoc. Craig’s responses to Hitchens’ objections to arguments from design proved this in spades. 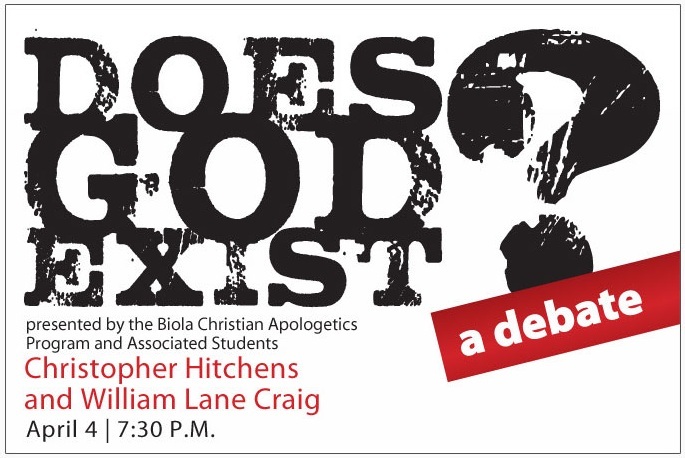 In his first rebuttal, Craig quotes Christian apologist Alvin Plantinga and portrays Hitchens’ belief in the scientific truth of evolution by natural selection as a faith-based commitment: atheists are ideologically committed to evolution since as an alternative to God it is the only game in town. This is a gross misrepresentation. Believing in evolution is not a faith claim at all, but accepting a coherent scientific hypothesis supported by masses of evidence and one that has survived sustained assaults by creationists. Even if evolution had not been discovered, or indeed was untrue, this would still not provide one shred of evidence either for design or a designer. After Hitchens in his opening speech rather beautifully recounted how he had the mitochondria trail of his African Homo sapiens ancestry traced with a DNA swab from his cheek by the National Geographic Genographic Project, Craig employed a ridiculous sound bite about the sheer “improbability” of evolution by natural selection. This next clip is from a different event, but it is virtually identical to what he said at Biola. There are two objections to a priori improbability of which Craig has no doubt been informed repeatedly. Firstly, Craig’s obsession with low probability is irrelevant since improbable events happen every day. If you crunch the numbers in relation to your own existence (i.e. the probability that a particular sperm united with a particular egg multiplied by the probability that your parents met, repeating the calculation back until the beginning of time), invariably you will get a fantastically low probability. Secondly, what is the probability of the supernatural alternative? What’s the probability that the universe is the product of a divine design? What’s the probability that the laws of nature are violated? It could be even lower. And what empirical data do we have to make the calculation at all? I have never heard an apologist answer these questions and Craig disappointed me yet again at Biola. I’m indebted to Erik Kreps of the Survey Research Center of the University of Michigan’s Institute for Social Research. An adept numbers guy, Kreps notes that it is not the number of years but the levels of human population that are the issue here. The Population Reference Bureau estimates that the number of people who have ever been born is approximately 105 billion. Of this number, about 2 percent were born before Christ came to earth. Kreps/ D’Souza/ Craig either misread the chart thinking the number of 1,137,789,769 at “Births Between Benchmarks” for 8000BC represented the people born before 1AD or just divided 106 billion by 47 billion and thought the 2.25 meant 2.25 percent. I just wonder how Craig’s God will be reinvented in the light of this correction. This idea that the universe is fine-tuned for human life is an utter distortion of physics by apologists who have leaped on part of a scientific concept as supposed evidence for their God. One look at the universe shows that it is anything but congenial for our kind of life. The Earth is the one speck of dust that we know is capable of supporting life in a vast abyss of virtual nothingness. Our observations of the nearest solar systems and planets do not bode well for the prospect of having intelligent carbon-based neighbours. Is that a universe that is friendly towards life? The planetary version of the Anthropic Fine Tuning Principle makes even less sense. Theists are basically saying, “Look how hostile the solar system is life. If it wasn’t for the gravity of Jupiter sucking up all the space debris, we’d have a cataclysm of the kind that wiped out the dinosaurs every five minutes. God must have placed Jupiter in the path of the asteroids when he was finally bothered to create beings who could worship him!” What nonsense! The Anthropic Cosmological Principle is like Darwinism. It is an alternative to the design explanation, not a feature of it. An all-powerful God would be capable of designing life to exist irrespective of the heat, cold, sunlight and asteroid conditions. Indeed, he could design us to survive in a hard vacuum! However, the inhabitants of CraigWorld see the vast emptiness of space and the sheer improbability of life and say, “Oh, it points to a designer God who created the universe with humans in mind!” But theologians keep their children fed by constantly reinventing their God to conform to the empirical data. Suppose we reverse the data and imagine a Star Trek-like universe where intelligent life is overwhelmingly probable and our extra-terrestrial neighbours visit us regularly (and not just long enough for a single frame blurry photo to be taken by someone driving a potato truck in Iowa). The theologians would still say, “Oh, it points to a designer God who created the universe with humans in mind!” The words, “cake”, “eat” and “have” spring to mind. Hitchens argues that the failed galaxies and certain destruction of the Earth by the explosion of its own sun do not imply a benevolent designer. Craig’s reply is that this does not disprove that they were designed, since manmade objects such as cars and houses are not built to last forever. True, but this was never part of Hitchens’ argument. However, you would be hard pressed to argue that this was all the result of an all-wise and all-loving designer who cared for his creations. Finally, Craig says that this objection has no purchase on Christian theism, since for Christians; the end of life on Earth is the beginning of eternal life. This is a ludicrous assertion that has no more substance than a child’s fairytale. Craig offers no evidence for a soul separate from the physical body or the prospect of life after death, aside from ancient scriptures, which of course predicted the end would come 2,000 years ago (Matthew 16). We are still waiting. Perhaps it’s time to give up and move on, Doctor? No, evidence is an occasional convenience in CraigWorld. What matters is good ol’ fashioned faith, as my third and final post tomorrow will demonstrate to degree of probability beyond mere inference to the best explanation. With his 100th post 😮 manicstreetpreacher begins his reassessment of a notorious debate as he tries to figure out where his hero went wrong. Craig was flawless and unstoppable. Hitchens was rambling and incoherent, with the occasional rhetorical jab. Frankly, Craig spanked Hitchens like a foolish child. So went the verdict of the web’s most fawning atheist Craigophile, Lukeprog, over at Common Sense Atheism a year ago today in respect of Christopher Hitchens’ debate against Christian apologist, William Lane Craig, at Biola University on the motion “Does God Exist?”. Luke subsequently commented that his piece was linked all over the web. Craig himself quoted it in his post-debate newsletter to his flock. Lee Strobel quoted it in his foreword to Craig’s latest apologetic, On Guard. I linked to it in my original comment piece back in June last year when the Biola DVD hit the torrents sites. I’m certainly not giving Luke the satisfaction of linking to it again here. I have mixed feeling about my original piece. After the damning verdict against Hitchens on the blogs was clearly exaggerated, I wanted to stick up for the guy. At the same time, my blood was very much up that he had let Craig get away with so much and smugly declare that his five pathetic “arguments” for God’s existence were unassailable and that his opponent had provided no evidence or argument that God did not exist, that it turned into an ad hominem rant against Craig. I originally titled it “We should all feel very sorry for this man”, which irritatingly still appears when the post is automatically generated by WordPress as a “possibly related” post. I even made some very unkind remarks about Craig’s spindly hands that since he is obviously close to punching his last ticket, he is dreaming of eternal life next to the Father’s right hand more than usual but will be sorely disappointed. “What a great analysis,” I thought when I hit “Publish”. Until one of the post’s first commenters pointed out that Craig suffers from a neuromuscular disorder that affects the appearance and movement of his hands. Damn. It has been my most reviewed and re-edited post. So one year after the actual debate, I have taken a step back and watched the tape again with the benefit of having seen and heard a lot more lectures and debates by Craig. The remainder of this post and my second and third posts will present what I now think. Two weeks before their debate, Hitchens sat on a panel with four Christian authors: Craig, Douglas Wilson, Lee Strobel and Jim Denison at the 2009 Christian Book Expo held in Dallas, Texas on Saturday, 21 March 2010. The debate moderated by Christianity Today writer Stan Guthrie, who in reality turned into a sixth discussion participant. The full audio of the discussion can be downloaded here; the full tape video is uploaded to YouTube below. Hitchens dominated the discussion and received most of the airtime and audience questions. However, in his closing remarks, Craig baited him by saying that his arguments amounted to “I don’t like it”, as opposed to “I don’t believe it’s true” and condescendingly asked him to engage more with him and his cohorts’ wonderful arguments in their upcoming debate at Biola. In an Apologia podcast immediately afterwards, Craig sounded incredibly pleased with himself, saying that Hitchens did not have the “intellectual capacity” to answer his arguments. The clip with Craig and Hitchens interviewed can be listened to here. Following the encounter, the blogs predicted a beat down for Hitchens at Craig’s hands, including former student of Craig and evangelical preacher turned atheist author and blogger, John W Loftus. I’ll come right out and say that Hitchens lost the debate. No two ways about it. While he didn’t come off as badly as Lukeprog’s infamous sound bite implied, he simply didn’t prepare enough in advance to answer Craig’s arguments. Hitchens is more concerned with the social effects of religion. Craig wanted to argue over its truth and after all, that was the debate’s motion. Craig boasts a great delivery at the lectern. He compresses his points very well and splits his arguments up piecemeal. Hitchens sears, flows and mixes it all up into one. He also has a habit of making “throat-clearing” precursors before answering points. Even so, I had severely underestimated Craig. A very few others aside, I had only seen his debates against Bart Ehrman and Victor Stenger which were the two occasions when he had been convincingly beaten. Having now seen and heard many more of his debates, I can see that Craig does not debate his opponents has such, but executes premeditated hit-jobs on them. Craig makes a point of not debating anyone without a doctorate. He made an exception with Hitchens, who has been a visiting professor at several universities, but as far as I know does not hold an actual PhD and during the debate, Craig referred to him as “Mister” rather than “Doctor” or “Professor”. Was this an attempt on Craig’s part to discredit the leading debater of the Four Horsemen? Very possibly. Craig employed every single one of his dirty tricks at Biola: scientific distortion, quote-mining of authorities, dropping in as many points as possible, patronising and intimidating erudition, demagogically pandering to the audience… the lot. It can take ten times as long to answer a question than to ask it. Craig fires out arguments in quick succession and then chides his opponent for failing to answer all of this arguments and objections. He also presented straw man versions of Hitchens’ own arguments, which took up a great deal of Hitchens’ time in his rebuttals, only for Craig of course go on and then say that Hitchens had not properly refuted his original arguments! Craig also constantly appeals to authorities. During the Hitchens debate he quoted external sources no fewer than 19 times! However, he is extremely selective in the way that he uses quotes. In their debates against Craig on the resurrection, Bart Ehrman and Bishop John Shelby Spong exposed Craig’s use of authorities on New Testament scholarship who in reality are deeply opposed. Richard Dawkins was quite right to refuse publically a debate against Craig on the grounds that the man is simply a “professional debater” rather than a proper academic worth taking seriously. Hitchens was too respectful and had clearly been taken in by the Craig hype, as his slightly nervous demeanour at the pre-debate press conference showed. So with the dust well and truly settled, let’s take a look at Craig’s arguments now he is unable to hide behind his debating tricks. My next post tomorrow will begin the deconstruction of Craig’s arguments and tactics piece by piece. Why Won't God Heal Amputees? The WORST Love Album In The World… EVER!!! A dark face to Rage Against The Machine’s Christmas Number One?